The dream of alternative smartphone platforms never found the great mainstream success it was looking for. Operating systems like Firefox OS, Ubuntu Touch, and Sailfish OS were supposed to give users options beyond the rank-and-file Android and iOS, but the latest statistics show the dominance of those two main platforms is only growing. Jolla, the company behind Sailfish OS, has been through some particularly trying times, releasing a smartphone that despite its innovative design was still poorly received (review), and crowdfunding a tablet that's suffered setback after setback. Despite its struggles, it seems that Jolla's not done with mobile hardware just yet, and today reveals its new limited-edition Jolla C handset. 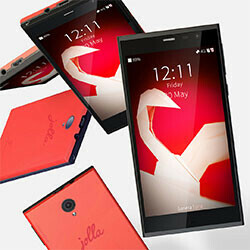 Jolla appears to have figured out by now that its products – and Sailfish OS itself – aren't for everyone. But the company does have its fans, and it's reaching out to them through the new Sailfish Community Device Program. For about €170, users can join the program and get access to special online support sessions, invitations to events, and a new phone: the Jolla C. The limited-edition handset is only being made available in a production run of 1,000 units, making it one of the most exclusive smartphones we've seen. The phone features a five-inch display (in a relatively low 1280 x 720 resolution), a quad-core Snapdragon 212 processor, and an 8MP/2MP camera pair. Storage is a conservative 16GB, though there's room for microSD expansion. A 2,500 mAh battery powers the phone. Unlike the first Jolla phone, there's no funky “Other Half” modular back-panel action here. The Jolla C runs a pure stock version of Sailfish OS, and select users will have the chance to try out bleeding-edge beta releases. Lest you think that the combination of a not-particularly-popular mobile platform and some hardware that might be better suited for a 2012 release would add up to an unappealing package, those 1,000 slots in the Sailfish Community Device Program – and the Jolla C handsets that go with them – have already sold out. Can Jolla find success by keeping things small for a while, further refining its offerings, and maybe trying again when the market's ready? All we know is that the company seems determined to stick things out, and isn't giving up yet. "The Jolla C runs a pure stock version of Sailfish OS..." Can we put skin on top of the sailfish OS? Good luck with this OS. I think there's no room for a third OS at the moment. Not skins so much as bloat: "Jolla C is powered by Sailfish OS in its purest form, without any pre-installed 3rd party apps." I would had loved to see other OS's being available in flagships phones. Sadly, that is not likely to occur when iOS and Android are the two major ones and far ahead anyone else. It would be only Microsoft that could catch up to these two! you know nothing about them, they have huge community and so many supporters. they rise $1m fund at indiegogo in less than 48hrs. even though they fail to ship it but people still believe in them. trust me those thousand of limited edition jolla phone will sell out in arrival. They also waited years for their second phone, which isn't appreciably better than the first and is just a rebranded Indian bargain phone, they screwed over almost everyone in their Indiegogo tablet fiasco, and they are circling the drain financially. They had their chance with a great OS, and they blew it. If you have to ask "WTH is Jolla and Sailfish OS," then you're pretty much DOA. 1280x720 pixels equals about a million pixels. On a surface the size of a fag packet. I don't know what your eyes are like - or what it is you think you'd do with a 1920x1080 screen that you can't do perfectly well @ 1280x720 - but one thing is for sure: the greatness of a smartphone is NOT measured in pixels. I have both the Jolla and it's Nokia predecessor, the N9, and finer smartphones are not to be found on this planet, except, perhaps, the venerable N900. I am convinced that anyone who has given either of these devices a chance would agree - indeed the Jolla C sold out the first day it became available. Wish I'd managed to get in there, but there will be more - get aboard!